Days before a major election, a low-level campaign worker opens a mysterious envelope. What he discovers transforms his perspective on power and politics in America. Donning a red clown nose, the volunteer transforms into Arturo Ui, an outsider businessman who decides to get into politics. As we dive deeper into the play, the other office workers take on the characters called for by the play and the lines between truth and fiction blur. Soon, Ui takes over a political party, hypnotizes the public, and rises to power. 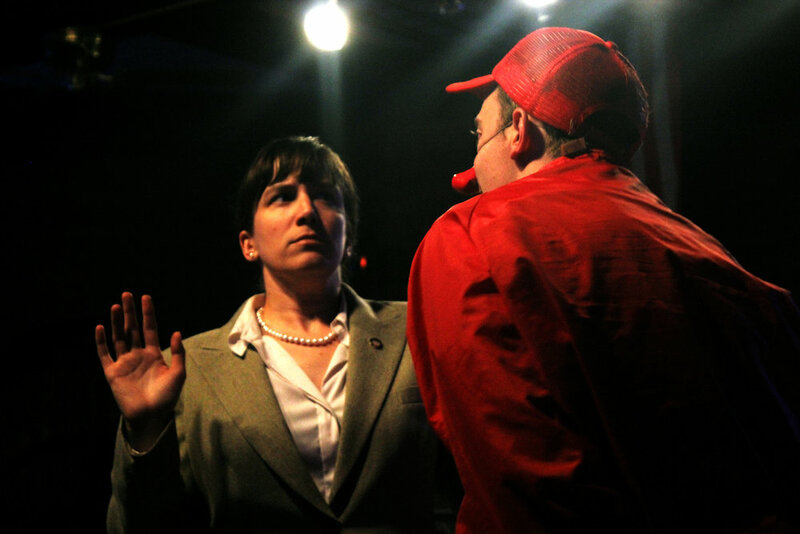 In this volatile moment, our relocated production of The Resistible Rise Of Arturo Ui asks what happens when democracy becomes a circus and a nation's imagination runs wild. Written in 1941, The Resistible Rise of Arturo Ui was Bertolt Brecht's attempt to explain to Americans how tyranny could come to a democratic state. In Jennifer Wise's modernized translation, eight actors play over forty roles, transform a stage into sixteen locations, and take audiences on a theatrical roller coaster that rivals the best that CNN can offer. A version of this article appeared in print on October 29, 2016, on page A20 of the New York edition with the headline: "New York Dramatists, Staging Revivals in a Year of Trump, Get Their Muse."